In 1908, the SS Silvia, owned by C.T. Bowring & Co. Ltd. of St. John’s, was wrecked off the coast of Massachusetts. Her owners suddenly found themselves in need of a new ship, and SS Florizel was commissioned to fill the gap. Ships in harbour, St. John's. S.S. Florizel, with bunting flying, 4 October 1914. Image from Memorial University of Newfoundland, Digital Archives Initiative. Built in 1909 by C. O’Connell & Company Limited in Glasgow, Scotland, the Florizel was designed to be a cut above. As a luxury ship, she was outfitted with furnishings such as brass, mahogany, and oak, and could carry 145 first class, and 36 second class passengers, as well as a crew of 60 and additional cargo. In the spring, all these fittings were removed, and she was refitted to join the sealing fleet. Her specialized hull had been built to withstand the North Atlantic ice, making her the only icebreaker in the sealing fleet at the time. In addition, the Florizel’s submarine signal detection system and wireless telegraph made her one of the most technologically advanced ships. She was the flagship and pride of Bowring’s fleet, sailing for their New York, Newfoundland and Halifax Steamship Company; later renamed the Red Cross Line. From the St. John's Daily Star. After her delivery to St. John’s in 1909, the Florizel was put into service on the St. John’s/Halifax/New York route. 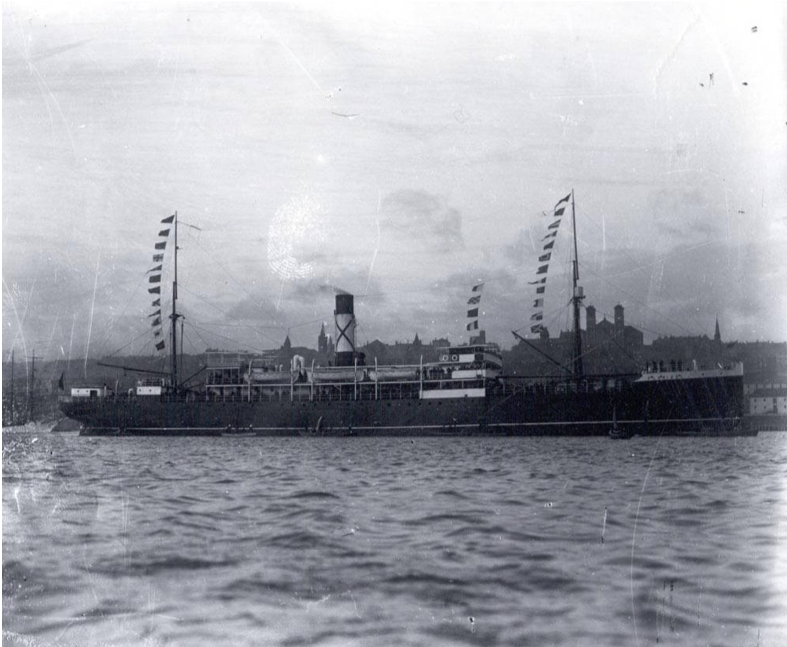 In 1911, the Red Cross Line acquired a second ship, the SS Stephano, to join the Florizel. This allowed Bowring’s to increase the amount of freight and passengers it could move during the year. It also meant that when one of the ships was occupied sealing, the other could continue to run its regular route. This same year, Bowring’s heightened the comfort on both ships by employing orchestras to play on board. The Florizel also helped bring commercial goods and groceries to St. John’s. Ads in the newspaper were common, announcing the arrival of fresh apples, oranges, potatoes, and bananas, as well as batteries and other household items. In 1916 she was also briefly contracted out to serve as a coal ship between Sydney and Louisburg, Nova Scotia. It proved to be a tedious assignment, as her holds weren’t designed to hold coal, but she successfully served her purpose and then returned to her regular route. SS Florizel jammed, sealers loosening ice. Image A 9-15 from The Rooms Provincial Archives. As a sealer, the Florizel broke several records under the command of Captains Abram and Joseph Kean. Between 1909 and 1916, the men brought their ship and her crew to the ice fields and returned with over 200,000 pelts. Using her icebreaking bow, the Florizel would ride up onto the think slabs of ice and use the weight of the ship to crack through. Her propellers could also be used to mash through the ice behind her if she ever became jammed. On the off chance that the jam was so severe that neither of those tactics worked, her sealers jumped into action, climbing over the rail and onto the ice below. Armed with poles, axes, and their own feet, they would work tirelessly to free the vessel. If need be, ropes were lowered from the side rails and the sealers would try to pull the vessel free. It was very dangerous, and very cold work, but it was often necessary. Non-Commissioned Officers on SS Florizel. Image A 58-157 from The Rooms Provincial Archives. From 1914 to 1916, the Florizel also operated as a troopship for the Newfoundland Regiment. The First Five Hundred (also known as the Blue Puttees) marched from the Pleasantville training grounds on the shores of Quidi Vidi Lake onto the decks of the SS Florizel on October 3rd, 1914. They anchored overnight in the middle of the harbour and set sail for England the following morning. After meeting a Canadian Convoy of ships off the coast of St. Pierre, the Florizel and company steamed off to Plymouth, England. During the next couple of years of war, the Florizel would make multiple trips across the Atlantic, ferrying Newfoundland’s young men to the port of Southampton, where they would board trains and head to various training depots around Britain. On February 23rd, 1918, the Florizel set out from St. John’s at 7:30pm. Her destination: Halifax. On board were 78 passengers, including St. John’s pharmacist Thomas McMurdo McNeil, Captain Joseph Kean (son of Captain Abram Kean), and three-and-a-half-year-old Elizabeth Shannon “Betty” Munn, travelling with her father, John Shannon Munn. John Munn was the stepson of Sir Edgar Rennie Bowring, and the managing director of Bowring Brothers Limited. Born in Harbour Grace to a merchant family, he had been educated in England and eventually rose through the ranks of Bowring Brothers. His daughter, Betty, was he and his wife Alice’s only child. John had booked passage for himself and Betty to join Alice, who had gone ahead to New York. The family then was planning on going on vacation to Florida. Also on board was Leonard Nicholl. A local carpenter, Leonard was travelling to Halifax to ply his trade while helping the city rebuild in the aftermath of the Halifax Explosion a few months before. Betty and John Munn, Thomas McMurdo McNeil, and Leonard Nicholl. In command was Captain William Martin. A 43-year-old career sailor, he first went to sea at the age of 19 and spent the rest of his life on vessels from barques to steamers. In 1911 he was transferred aboard the Florizel as her Chief Officer, and then to the Stephano, also as her Chief Officer. Following the sinking of the Stephano by a German U-Boat in 1916, Martin had been given command of the Florizel. Chief Engineer J. V. Reader manned the engine room, with a crew of 14 Spanish stokers whose job it was to keep the boilers filled with coal. And in her hull, the Florizel carried over $250,000 worth of cargo. This would be worth $3.5 million in today’s currency. While the weather was calm when the ship sailed out through the Narrows, it quickly deteriorated. The winds picked up and a blizzard moved in, seriously reducing visibility for the crew. Large waves crashed against the hull, but the Florizel’s engines never faltered, continuing to push the ship forward through the night. Captain Martin charted a course; this trip, like the many before, should have had them arriving in Halifax around 47 hours after their departure. Unfortunately, slob ice along their route meant that they couldn’t drop their ship log, which meant they could not calculate how quickly they were travelling. What probably seemed like a small inconvenience at the time would have consequences later. After nine hours of steaming from St. John’s and fighting against the weather, Captain Martin looked at his charts and figured that by this point, they should have cleared Cape Race on the Southern Shore. He ordered a change in course, turning southwest towards Nova Scotia. They should have been making about eight knots. Unfortunately, his calculations were incorrect. Unbeknownst to him, Chief Engineer Reader had pulled back on the engines. Reader’s family lived in Halifax, and it was his hope that if he delayed the Florizel’s arrival by just a couple of hours, they would have to spend the night, and he would be able to see his family. This decision proved to be the costly undoing of the Florizel. Instead of the eight knots that they should have been making they were only doing four. This put the Florizel off course, and in peril. As the ship turned westward, Captain Martin spotted ice off his bow. What he didn’t know at the time, but what would quickly become evident, was that it wasn’t ice – it was white caps, crashing over the rocks of Horn Head Point. They had not cleared Cape Race; instead, they were only just past Cappahayden. A few moments later, Captain Martin and his ship crashed right into the rocks. The Florizel became grounded just 250 metres from shore. As the swells crashed the ship against the jagged shoreline, the bottom tore out of her and she began to list. Waves crashed over her decks, and the crew rushed to send out a mayday. The message was clear and to the point: "S.O.S., S.O.S., S.O.S. Florizel ashore near Cape Race. Fast going to pieces." The message continued non-stop for a few brief moments before the ship lost power, and the transmission cut off. The ship was dark, battered by the weather and cold. The survivors were on their own. Salvaging the wreck of SS Florizel. Image A 68-105 from The Rooms Provincial Archives. Many passengers and crew were killed in those first few moments. Survivors on deck clung to the railings, the walls, and each other as wave after wave washed over the decks of the foundering ship. The officers and crew did their best to set an example, encouraging passengers to hold on and not give up. During one particularly large wave, Betty Munn was ripped from her father’s arms as they clung to the rail of the ship. A crewmember reported reaching out to him, encouraging the man to grab his hand and hold on. Mr. Munn allegedly looked at him, defeated, and in the next wave, he too was gone. The storm carried off the ships bridge, her lifeboats, and most of the superstructure. Forty people, hiding in the smoke room, were lost when the seas carried it away. The only section left was the Marconi Room, a seven feet by eight feet shack protected from the sea by the funnel. It was here that around thirty survivors huddled through the cold night and most of the following day, waiting for help to arrive. Word had quickly spread about the plight of the Florizel, and many ships scrambled to respond to the call for help, although their efforts were hampered by the snowstorm. The SS Prospero and SS Hawk were first on the scene in the late evening of the 24th,. The Prospero, commanded by Captain Stephen Parsons, had only just arrived in Marystown when they received word of the Florizel’s plight. He had intended to stay in Marystown harbour to weather the storm, but instead turned around quickly and set back out into the night. Upon arriving at the wreck site, he managed to manoeuver his ship within two to three ship lengths of the wreck. But no matter how many calls or signals his crew sent out, they could not see any sign of life on the Florizel. Eventually, more help arrived, and small boats from five ships (Home, Prospero, Gordon C, Hawk, Terra Nova) launched boats from their decks and began to pull survivors from the wreck. Newfoundland Royal Naval Reservists from the HMS Briton (previously HMS Calypso) had been called to action and were onboard, putting their training and skills to the test. The rescue was long and tedious, with dory after dory struggling to the reach the Florizel, pulling survivors from the ship and from the water, and then making their way back to their vessels. The last survivor was pulled to safety 27 hours after the ordeal had begun. In the end, of the 138 souls that had been on board only 44 survived. As the last of the survivors were pulled to safety, the rescuers were able to fully appreciate the shocking disaster. The shoreline was strewn with pieces of the wreck, some as small as matches. The storm had done a true number on the pride of the Bowring fleet. Over the next few weeks, the residents of nearby communities assisted in the recovery of the bodies that washed ashore. 93 bodies were eventually recovered and returned to St. John’s for burial. The remains of Thomas McMurdo Mcneil, John, and Betty Munn were recovered in March 1918 and returned to St. John’s for burial. Leonard Nicholl, the carpenter en route to Halifax, was never found. He left a widow and five sons in St. John’s. With no head of the household, the eldest son, at the age of 10, stepped into the role of breadwinner. The men of the SS Gordon C, SS Terra Nova, SS Hawk, SS Home and SS Prospero had shown exemplary courage, strength and perseverance throughout the entire rescue and recovery. For their efforts, 35 of them received the Royal Humane Society Medal for Bravery at Sea. Following the sinking, an enquiry found Captain Martin responsible for the accident. He was declared negligent because he didn’t take any soundings before issuing the order to change course. Had he done that, he would have discovered that they were off course. His certificate was suspended for twenty-one months (though he was able to continue as a mate during that time). The actions of Chief Engineer Reader were later brought to light by 3rd Officer Philip Jackman. Reader was lost in the disaster, but his actions were strongly condemned by the enquiry. In the coming years, a memorial was erected in Mount Carmel cemetery to commemorate those lost on that stormy night. Another smaller memorial was also erected in the cemetery – this one to remember the Spanish stokers who had manned the boiler room. Of the 14, only one survived the disaster. To this day, the Spanish navy holds an annual memorial service at the graveside, remembering those sailors who passed away. Peter Pan statue, Bowring Park. Image VA 6-12, fromThe Rooms Provincial Archives. In Bowring Park, next to the duck pond, a Peter Pan statue was erected in memory of little Betty Munn. 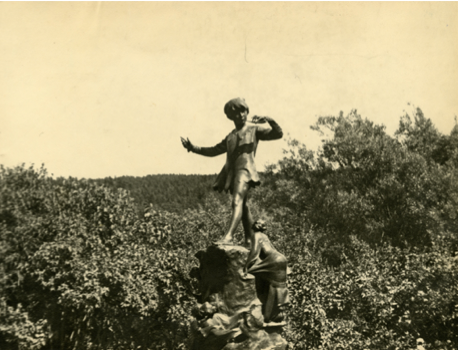 The exact replica of the Peter Pan statue that stands in Kensington Gardens in London was placed inside the park and unveiled in August 1925. The park had been opened four years before the sinking of the Florizel, and Betty had spent quite a bit of time there. The plaque on the side of the sculpture was inscribed with the phrase “In Memory of a Dear Little Girl who loved the Park”. Peter Pan had been Betty’s most loved fairy tale. The names of many of those who perished were well known in the community. As with other disasters since then, such as the Ocean Ranger or Cougar Flight 491, the sinking of the Florizel touched many lives. Everyone had lost someone, or knew someone who had lost someone. Faces like Betty’s, well known around the city, meant many felt the loss on a personal level. In the aftermath of the accident, the Red Cross Line suffered. The loss of the Stephano in 1916 and now the Florizel meant they took a large hit, financially. As Bowring began to branch out into other operations, they decided to cut their losses. The Red Cross Line was sold to the transportation firm “Furness, Withy” in 1928. The Florizel was a familiar presence in St. John’s harbour during her career. Her role as a troopship made her synonymous with the Newfoundland Regiment, the enthusiastic response to Britain’s call to war, and the pride that came with it. The Newfoundland Naval Reservists who responded to her mayday call found an opportunity to use their training and skills at home. Their bravery stood as a further testament to the strength of Newfoundland. This story, and others, continue to feel familiar even though they are generations past. The tales of loss, strength, courage and perseverance that came out of the sinking of the Florizel continue to capture the imagination, and will continue do so for years to come.